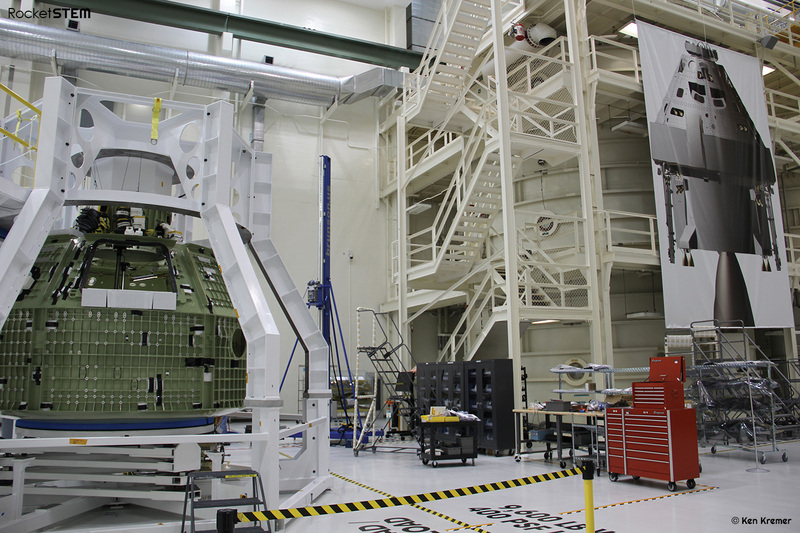 NASA is making steady progress toward liftoff of the inaugural space-bound Orion crew capsule. The agency aims for a Florida blastoff of the uncrewed Exploration Flight Test-1 mission (EFT-1) – about 18 months from now – in September 2014 atop a Delta 4 Heavy Booster, NASA officials informed me. Orion will ultimately fly astronauts to deep space destinations including the Moon, asteroids and Mars. I recently inspected the Orion during a visit to check the work in progress inside the cavernous manufacturing assembly facility in the Operations and Checkout Building (O & C) at the Kennedy Space Center (KSC). A lot of hardware built by contractors and subcontractors from all across the U.S. is now arriving at KSC and being integrated with the EFT-1 crew module (CM), said Jules Schneider, Orion Project manager for Lockheed Martin at KSC. “Everyone is very excited to be working on the Orion. We have a lot of work to do. It’s a marathon not a sprint to build and test the vehicle,” Schneider explained to me. The bare bones, welded shell structure of the Orion crew cabin arrived at KSC in Florida from NASA’s Michoud facility in New Orleans in June 2012. Since then, technicians from Lockheed and United Space Alliance (USA) have made noticeable progress preparing the craft. Technicians were busily installing avionics, wiring, instrumentation and electrical components as the crew module was sitting inside the Structural Assembly Jig during my follow-up visit. The Jig has multiple degrees of freedom to move the capsule and enable assembly work. “There is a huge amount of electrical harnesses that have to be hooked up and installed and soldered to the different instruments. There is a lot of unique wiring for ground testing, flight testing and the harnesses that will be installed later along with the plumbing. We are still in a very early stage of assembly and it involves a lot of very fine work,” Schneider elaborated. Ground test instrumentation and strain gauges are installed internally and externally to measure stress on the capsule. Construction of the Orion service module is also moving along well inside the SM Assembly Jig at an adjacent work station. The SM engines will be mass simulators, not functional for the test flight. The European Space Agency (ESA) has been assigned the task of building the fully functional SM to be launched in 2017 on NASA’s new SLS rocket on a test flight to the Moon and back. Over the next few months a great deal of work is planned. The next parachute drop test is set for February 2013. The heatshield skin and its skeleton were manufactured at a Lockheed facility in Denver, Colorado and being attached this month. “In March 2013, we’ll power up the crew module at Kennedy for the first time,” Brandi Dean, a NASA Public Affairs Officer told me. Orion will soar to space atop a mammoth Delta IV Heavy booster rocket from Launch Complex 37 at Cape Canaveral Air Force Station in Florida. Construction and assembly of the triple barreled Delta IV Heavy is the pacing item upon which the launch date hinges, NASA officials informed me. “Following the EFT-1 flight, the Orion capsule will be refurbished and reflown for the high altitude abort test, according to the current plan which could change depending on many factors including the budget,” explained Schneider.